A thought collective is defined by Fleck as a community of persons mutually exchanging ideas or maintaining intellectual interaction (1935a, II.4). Members of that collective not only adopt certain ways of perceiving and thinking, but they also continually transform it—and this transformation does occur not so much “in their heads” as in their interpersonal space. It is easy to observe this phenomenon in everyday life. When a group of people speak about something important, they start to speak about things which would not cross their minds if they were alone and which they would not tell if they were in another group of people. There arises a thought style characteristic for that group. There also arises a certain collective mood which straightens up the ties among the group members and inclines them to act in a certain way. Some collectives last shortly—even only as long as an individual conversation lasts. When social forces connecting people operate for a long time, there arise thought collectives lasting for many generations. They take forms of religious movements, folk traditions, art or science. Long-lasting collectives create social institutions which enable and regulate the method by which next generations are added to a given collective: educational systems and social rituals accompanying the admission of new members. All members of small ethnic groups belong to the same thought collective: everybody perceives and thinks in the same way, just like everybody performs the same or very similar actions. Within more developed societies there are many various collectives: religious, artistic, scientific, astrological, and those related to fashion, politics, economy, medicine, quack, sport, etc. When a thought style, developed and employed by a collective, becomes sufficiently sophisticated, the collective breaks into a small esoteric circle—a group of specialists which “are in the know”—and a wide exoteric circle for all those members, who are under the influence of the style, but do not play an active role in its formation. Members of the first group are those “initiated”—priests and theologians in the case of religion; artists and art critics in the case of art; scientists in the case of science etc. The corresponding exoteric circles for those groups are: lay believers; art-lovers; school teachers of physics, chemistry, and biology, and also engineers and all people interested in science. Exoteric circles have an access to a proper thought style only through esoteric circles—for example through listening to sermons given by priests, or reading popular literature written by scientists. Members of exoteric circles trust the initiated. But specialists and members of esoteric circles are not independent of exoteric circles: this is the “public opinion” which justifies the efforts of specialists and gives them a stimulus to continue their work. In contemporary societies almost everybody belongs to many thought collectives; e.g. a scientist may be also a member of a certain church, political party, mountain climbing club. An individual usually belongs to distant thought collectives, so that conflicts between thought styles coexisting in him/her do not arise. Most of people belong only to exoteric circles; only few become members of any esoteric circle, sporadically belonging to more than one. Everybody also belongs to a wide “everyday life” collective (which also differs from culture to culture). Within the esoteric circle Fleck distinguishes the following subgroups: (1) vanguard, “the group of scientists working practically on a given problem”, (2) the main body, “the official community”, and (3) the group of stragglers (1935a, IV,4). In other places he omits stragglers and introduces a distinction between professionals (specialists sensu stricto) and more general specialists (1936, VI). I care about this because I have a strong desire to point out that exoteric “believers” in scientism are more similar than dissimilar to the exoteric believers of a religious viewpoint. Everybody is taking someone’s word for it and talking in ways that are clichéd. But even among professionals, competency is so limited by human finitude, that I am not sure that life’s really difficult questions are fully within our reach. Scientism has a methodological problem with value, but its exoteric adherents are happy to trust their “studies” to deliver technique and call it value. 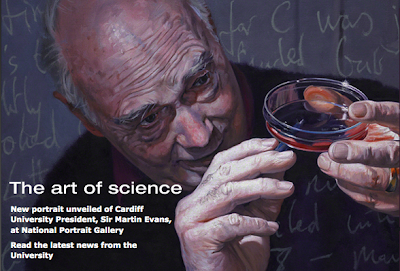 I love this very Polanyian painting from Cardiff University (click photo for link). A New Clue to Explain Existence? Similarly, the history of philosophy of science is about scientists on the losing side of first-order disputes who acquire epistemic leverage by ascending to the second-order inquiry, namely, the ideals that should guide the conduct of science. This explains the schizoid attitude of practising scientists, who are at once dismissive of philosophers’ substantive scientific views, while they remain uneasy about whether their own research practices are sufficiently rational, objective, etc. However little their own practice conforms to philosophical ideals of inquiry, scientists feel compelled to justify it in those sanctified terms. Thus, science’s own eternal return of the repressed helps to explain the confused legacy of the philosophy of science.